You start with a vision, then you need to find a way be inspired in order to reach your goal. Without a true love for your training and a burning desire to be the best you can be, you will have difficulty pushing yourself to do what has to be done in the face of obstacles. It will be too easy to skip a workout now and then. A coach can give you support and guidance on your running, but you have to supply the rest. Only you can push yourself when you’re tired, or make yourself work out when distractions get in the way. We often read about athletes overcoming physical challenges. Lance Armstrong survived testicular cancer and won the Tour de France three times. Marla Runyan ran in the 1500 meters of the 2000 Olympics while being legally blind. It is out of these challenges that athletes develop a fierce, burning desire to succeed. They need to prove to themselves that they can achieve their goals. Through these kinds of examples we can begin to understand that desire is sometimes more important than even talent or a healthy body. So your inner fire, your drive must come from within, regardless of whether you’re a novice, a serious athlete, or competing at the elite level. The good news is that building and maintaining a high level of self-motivation is a learned skill that anyone can acquire. Motivation is energy, and that sense of self-directedness is one of the most powerful sources of energy available to an athlete. From internal motivation you gain the willingness to persevere with your training, to endure discomfort and stress, and to make sacrifices with your time and energy as you move closer toward realizing your goal. What are the key characteristics of athletes with an inner fire? Through my extensive work with numerous athletes over several years, I have developed a constellation of the SEVEN TRAITS that define the champion’s mentality. Self-direction and internal motivation: Champions decide early on that they are training and competing for themselves, not for their parents, their coaches, or for the medals. Direction and drive need to come from within. The goals must be ones that you have chosen because that’s exactly what you want to be doing. Ask yourself, what keeps you training? Who are you doing it for? 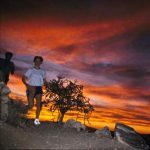 In part 2 of this series we will go over all seven key characteristics for runners with an inner fire so you can make them part of your training.